Meet Catherine, one of our talented Designers who has a passion for enhancing the beauty of spaces around her. Since joining Haven Design Works in 2016, Catherine has quickly become an integral part of the Haven design team. 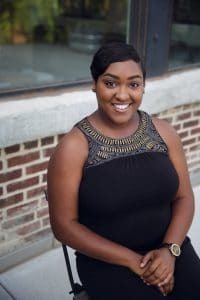 Her talent in bringing innovative and on-trend designs to each and every project has remained constant since graduating from Valdosta State University. Her vibrant and unique design perspective is a great asset when designing for the millennial generation and first-time buyers. Described as her favorite projects to work on, Catherine relies on her own sensibility to design spaces that reflect the mindset of the ever-growing millennial buyer segmentation. Like many millennials, Catherine loves to find project inspiration on social media, and Pinterest – from photographers to makeup artists to décor bloggers. She uses these mediums as a catalyst to sparking inspiration in her creative process. When it comes to incorporating the latest design trends in her projects, Catherine loves adding touches of texture and natural materials throughout her spaces. Layering texture in her bedding, accessories, and even dimensional wall art, are all go-to ways for adding visual interest. Bringing greenery in through succulents or eucalyptus vase filler also help bring the outside in, contributing to a relaxed lifestyle vibe. Looking ahead towards emerging trends this year, Catherine says buyers should start incorporating rich jewel tone colors throughout their houses on accent walls, pillows, and accessories. Pops of colors in a neutral space can create the dramatic impact that will leave all your guests talking! Check back soon for our next Designer Spotlight, or visit our blog to find out more about our amazing Haven Design Works team!